This year a remarkable anniversary in the sport of climbing has gone virtually unnoticed. I was particularly reminded of it when I sat down to talk with John Gill yesterday in Pueblo at a local coffee place. In the spring of 1961, over fifty years ago, according to an interview in the first edition of Master of Rock, John Gill did the first ascent of the Thimble Overhang, a 30-foot problem/route that became legendary in the history of world climbing. Climbed onsight solo over a very serious landing, it was probably the hardest single pitch in the country, a climb that went unrepeated for literally decades. Today rated V4 or approximately 5.12a or b, it was put up in a time when, in the US, 5.10 was the absolute limit and the average free climbing standard was closer to 5.8. But beyond the difficulty (after all Gill had bouldered V9 in 1959! ), The Thimble represented the future of climbing. 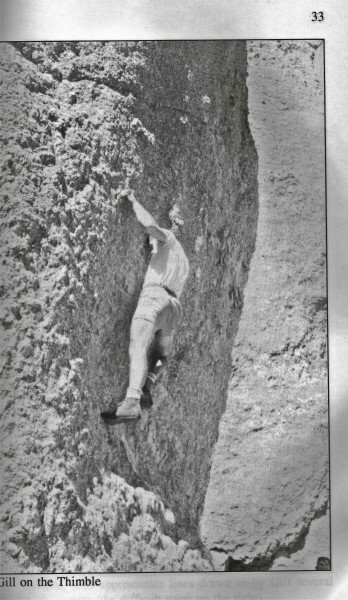 Whether runout on the granite knobs of the Bachar-Yerian (1981) or perched on the miniscule edges and pockets of To Bolt or Not to Be (1986), the climber is on terrain that was first definitively explored by Gill. Sustained steep face climbing, especially once the bolt wars had been resolved (more or less) has been the common currency of cutting-edge climbers world-wide. Furthermore it marked a new era in terms of the scale and nature of the objective. None of Gill's more famous contemporaries would have viewed the Thimble route as a desirable objective, given the size of it and the blatant risk. Certainly none of them repeated it, nor is it likely they could have, given the specialized strengths of body and mind required for the route. But more interestingly none would really have seen the formation itself as much more than a footnote or afterthought, being too small in stature and too mundane in location to merit the effort and risk of an ascent, especially given that an ascent of El Cap probably posed less physical hazard. The concentration of effort to free climb such a short objective, developed considerably already by Gill with his boulder problems, was a foreign concept in world climbing at the time. Perhaps it was his personality, reflected later in his mathematics career, patient, understated but deeply persistent in the pursuit of a solution to a problem that proved to be crucial. But prior to this ascent, the notion of a climber spending days working out a free-climbing challenge was unheard of. This obsessive quality is taken for granted now, like many of Gill's contributions to the modern sport of climbing, and its origin is for the most part forgotten. We are all tempted to forget the place of history in the sport of climbing, to see it as lived in the present moment, in some edenic ahistorical state of mind or place. This is small-minded and ungenerous to the past. I try to imagine instead a young man, strong and determined, focusing his considerable powers of mind and body on this rock, listening to the wind whispering through the spires and pine forests of the Black Hills and making the decision, contrary to all expectation, in defiance of the norms of the time, to explore this undiscovered realm. This happened fifty years ago and utterly and irreversibly transformed the idea of climbing forever. Hopefully we can honor this achievement in our own memories and our pursuit of climbing. Walter Bonatti, who was one of the most influential climbers in the postwar scene in the European Alps and Himalayas has died at 81. Noted especially for his solo ascent of the Bonatti Pillar on the Dru in France, he was also embroiled in controversy regarding the Italian expedition to K2 in 1954. He retired for the most part from serious climbing at 35, after a solo new route on the Matterhorn in winter.The author of a number of books on climbing, he was regarded as one of the best writers on the sport. The best obituary I have seen so far in English is at Planet Mountain. An excellent profile from the Guardian in the UK is online as well. At the end of the Guardian profile Bonatti was quoted as saying, "You see, the real essence of mountain climbing – of really knowing and loving the mountains – is not getting to the top. It's having the humility and self-awareness when necessary to be able to stop 100 metres from the summit and make it down alive." Now that the fall semester is over, the days of multiple visits to the Park have ended. But something else seems to be going on as well. Last Saturday, I hiked up to Upper Chaos to give another go on Barbed Wire Beard, a classic "It's just the one move" kind of problem and found myself completely unmotivated and incredibly tired. I bumbled my way down to look at Freshly Squeezed and still could not shake the sense of deep fatigue. There is a slightly surreal ambiance of warm sun and wildflowers still in effect up there but for who knows how much longer. Perhaps this fall season will be another long one, allowing a few more visits on weekends but the feeling of lost momentum lingers even as the temperatures become more favorable. Stasis is the word the ancient Greeks used to describe the absence of progress when opposing forces of equal strength meet, not so much in stable equilibrium but in constant conflict and disruption. For me this is my life as far as bouldering is concerned right now, unproductive effort resulting in frustration. Philosophers such as Aristotle would say that I might working against something in my inner nature and I have thought about this myself. What would a meaningful goal in climbing really consist of? A number? A specific problem? Something else? To realize this goal may require letting go of others, goals that only appear to be meaningful from a sufficient distance. 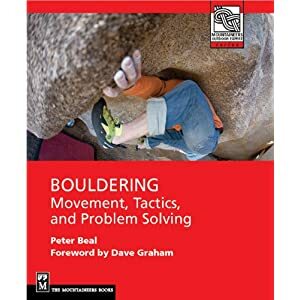 A webmaster in Europe wrote of a recent piece, "It is targeted to climbers/boulderers who are interested in a deeper sense of doing such an activity and I guess that your article could be hardly understood by any younger climbers..." I am concerned not just about younger climbers not seeing the problems in current climbing attitudes and practice but all climbers. Is climbing merely a way of evading/avoiding the deeper signs of crisis that are sounding everywhere in our time? Perhaps this is the conflict that is weighing on my mind, a conflict that even the grandeur of the Park cannot overcome. Chuck Fryberger's latest film is premiering at the Boulder Theater tonight so I thought I would give a quick review of it. I have been a big fan of his previous films, Pure and Core, films which garnered mixed reviews from audiences owing in part to Chuck's willingness to experiment with locations, filming techniques, and offbeat themes. With The Scene, those concerns can be set aside. Beautiful camera work, check. Hard routes and problems, check. Interviews with climbing stars, check. But aside from Dave Graham's segment, which is admittedly not very representative of the scene in Boulder (or anywhere else), the feel of the film is much more conventional than past efforts. I found it enjoyable to watch, for sure, but the dynamic visual and emotional range that Chuck has shown elsewhere is mostly absent. The only scene that hinted at something more innovative, a bit darker and more interesting, was the opener for Bishop, but it's not developed. There are hints of something different in the profile of the comp/pro scene in Innsbruck, a sense of a vacuum beneath the logos, crowds and bright lights, a feeling that, like the slopers and crimps on the problems, the climbers are holding onto, well, nothing really. It is a relief to turn to the limestone around Innsbruck for a little while, though all too brief a while before we are back at a World Cup in Slovenia. The segment on Spain seems to find its way more successfully than the others though again, there is this avoidance of any exploration of the meaning of all this activity, any searching for a deeper dimension. The potential for getting something more out of an aging Chris Sharma or Dani Andrada seems there but instead they are treated the same as the rest. Just climbers working their way up the chalk marks on a steep limestone wall, apparently with nothing else to do in life. Chris Sharma describes his life as a climber up to this point as mostly "passing through" and the feeling of the film is very similar. Climb a climb, get the word out to the public and sponsors, move on. To where? A muerte?